The Elmwood Centre for counselling and psychotherapy is centrally located close to Dublin city centre. Our therapy rooms are beautifully decorated and equipped filled with natural light and provide the space, privacy and comfort essential to a healing and therapeutic environment. We can also offer very competitive rates to rent rooms on Saturday and Sundays for group work. We welcome enquiries from qualified/accredited therapists who hold professional insurance and are members of their professional organisations. Excellent amenities, restaurants/cafes/shops on our doorstep. 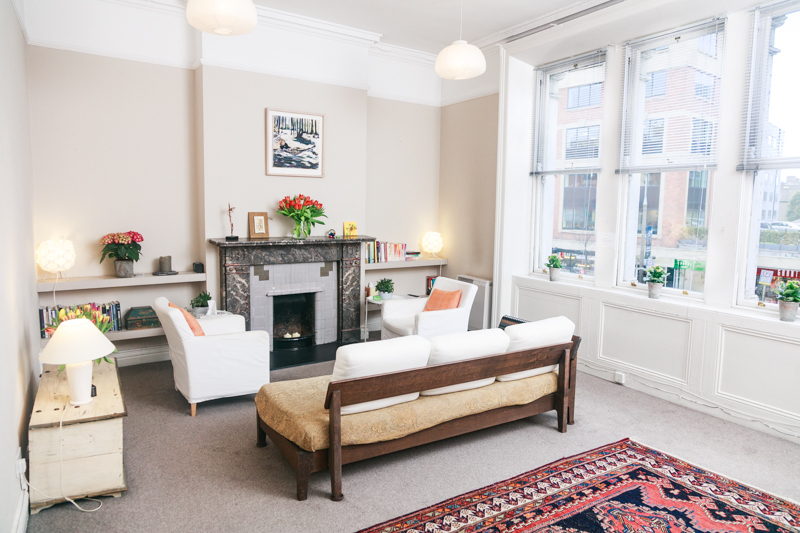 Our rooms are available to rent and are suitable for psychotherapists, psychologists and other professionals working in the mental health arena. Our rooms are also currently rented out for professional supervision, training and group work. The Dart, Luas and St Stephens Green are all a 15/20 minute walk away, with ample parking in the area. There is also an excellent bus service on Baggot Street too, with the no’s 37, 38, 38a, 39a, 18, and 70 bus routes outside the door. Our rooms are available 7 days a week, from 8am to 10pm, making them an ideal venue for those who want a central location with easy access and convenience for both clients and therapists. The Baggot Street area has excellent amenities, with many restaurants, cafes and shops on our doorstep. All therapists in the Elmwood Centre operate as independent sole traders. They each have their own professional indemnity insurance and are accredited by their respective professional bodies.